Gallant fishermen lost attempting to rescue distressed barque Lalla Rookh, an East Indian trading ship carrying rum and sugar. For want of a lifeboat, their small open ferry boat Lady Lump overturns in tumultuous sea drowning the brave eleven: Harry Bacon, John Belville, James & Steve Edwards, Bill Hoskins, Harry, Jim, Jimmy & John Newman, Harry Slaughter & Bill Wicks. Lugger launched with 20 fine fishermen, of which 12 rig up fresh canvas on gale-swept 700 ton Lalla Rookh&apos;s two remaining masts, and with difficulty sail her to London destination: George & Jim Benn, Ed Blann, J Burtenshaw, Tom Coppard, Harry Head, Bill Marshall, Jim Searle, George Steere, John Teasdale, John Tester & George Wingfield. The other 8 sail lugger safely back to shore: Alex Churcher, John Collier, Ed & Pete Edwards, Bill Field, Bob Hills, Steve Parsons & Harry Wingfield. Nationwide appeal for their 47 dependants raises huge total of £5,000. Another fund raises £120 locally to build a self-righting, rowing and sailing lifeboat at Harvey&apos;s of Littlehampton. 1st lifeboat, 27 feet long and taking 10 oars, borne out of Lalla Rookh tragedy, installed in flint lifeboat house opposite coastguard station at west end of town. Horse-drawn iron carriage built to transport the rescue craft down the stony beach and into powerful breaking waves. Lifeboat launch to vessel called the Number Four in difficulties. Lifeboat crew: James Hutchinson (coxswain), George Woods, George & Richard Wells, Henry Wingfield, Tom Bridges, Will Street, Rob Upton, Will Freeman, Charlie Groves and John Belton. Lifeboat launch in terrific gale to distressed cargo ship The Plough. The lifeboat, despite colliding with a groyne and taking in water, continues for 4 miles. Brave lifeboat crew: George (Johnny) Tyler (coxswain), George Hutchinson (second coxswain), Walker Burden, William Goble, Chas. Slaughter, Richard Wells, John Belton, Harry and William Freeman, Chas. Giles and John Riddles. Lifeboat launch to cargo sloop Iron Duke being driven towards shore by very rough weather. Lifeboat crew board her and struggle to take control. Last service for Worthing&apos;s independent lifeboat, under the command of Coxswain Parkes, through heavy squalls in a southerly gale to the distressed vessel Billy Boy..
RNLI takes over the Worthing station. New, improved lifeboat built, and new horse-drawn transporting and launching carriage constructed. First RNLI lifeboat the Jane, a 32 feet long self-righter powered by oars and sail, is delivered by rail from London. Exercised at the initiation ceremony under the command of Coxswain Alfred Dean and Second Coxswain Tom Blann, and rowed by a double bank of oarsmen. The craft&apos;s self-righting and self-relief of water abilities demonstrated by crew: J Marley, Wm Wood, W Greenyer, R Wells, G Wells, T Davis, G Goble, F Honess, Wm (Bill) Marshall and T Tester. New larger lifeboat house built in Crescent Road for £242 on land costing £68. Terrific gale spotted driving distressed brig Cyprian Queen shoreward between Ferring and Kingston at 4.15pm. The Jane on its carriage drawn by 6 horses launched there. When mission accomplished, under the command of Alfred Dean, coxswain and Tom Blann, 2nd coxswain, the Jane sailed back to Worthing. Meanwhile, carriage still returning from Kingston on rough night. Boat rehoused at 4.15 am. Crewman of great stamina working for 12 hours: Tom Davis, Wm (Bill) Wood, John Marley, John Tester, Tom Bridger, H Bashford, T Bacon, C Marshall, Henry (Harry) Harwood and William (Bill) Greenyer. The Jane launched to 59 ton schooner Julie & Marie, carrying &apos;oil cake&apos; from Nantes, flying a distress signal. Coxswain Dean&apos;s crew: Fred Honess, Bill Wood, C Groves, John Tester, George Tyler, John Bacon, H Hammond, J Benn, H Collier, J Wingfield and William (Bill) Beck. In ferocious storm the Jane sent to rescue &apos;merchant crew hanging on to sides&apos; of wrecked French brigantine. Coastguard fired maroon to summon lifeboatmen: coxswain Dean, 2nd cox John Marley, John Tester, J Poland, H Freeland, William (Bill) Freeman, R Ayling, Bill Marshall, Luke Wells, T Bridger and W Davis. Lifeboat launched from beach to east of Pier, offering some little protection from prevailing elements. Propelled by strong gale, 170 ton brig Hilena observed through driving rain dangerously close to coast in a heavy sea with flag at half mast (sign of distress). The Jane launched and 4 lifeboatmen board the Hilena and pilot it to the safety of Shoreham Harbour. Saved Hilena and its 6 crew. Lifeboat crew: Alfred Dean (coxswain), Reuben Ayling, J Poland, G Goble, T Bridger, Bill Marshall, W Greenyer, F Honess, G Davis, J Tester, John Bacon, Luke Wells and W Wells. In severe storm, the Jane rescues 2 craft on 1 service: the Selsey fishing smack Active and a small capsized boat Brave Chillon of Boulogne. Lifeboat crew: Alfred Dean (coxswain), William (Bill) Wood, J Poland, Fred Honess, T Davis, T Harris, Bill Beck, Luke Wells, C Ayling, J Rouse, J Clarke, T Bridger and G West. Worthing&apos;s third consecutive lifeboat house opens on seafront with panoramic view of sea from lookout turret. At 40 ft long and 17ft 6ins wide it cost £610. Still stands today at 107 Marine Parade, albeit converted to a residence. Crescent Road lifeboat house sold for £150. The Jane launched through mountainous surf in dreadful conditions to distress lights spotted 3 miles out. Men of valour: Alfred Dean, cox, Charles Lee, 2nd cox, Reuben Ayling, George Goble, Luke Wells, W Davis, Thomas Davis junior, Bill Marshall, E Bacon, Mark Wingfield,James & George Bashford. During the great flood, lifeboat ordered out to 5 large fishing boats in fierce gale. Successfully manoeuvred severely damaged 15 ton local lugger Harkaway, to Shoreham Harbour. 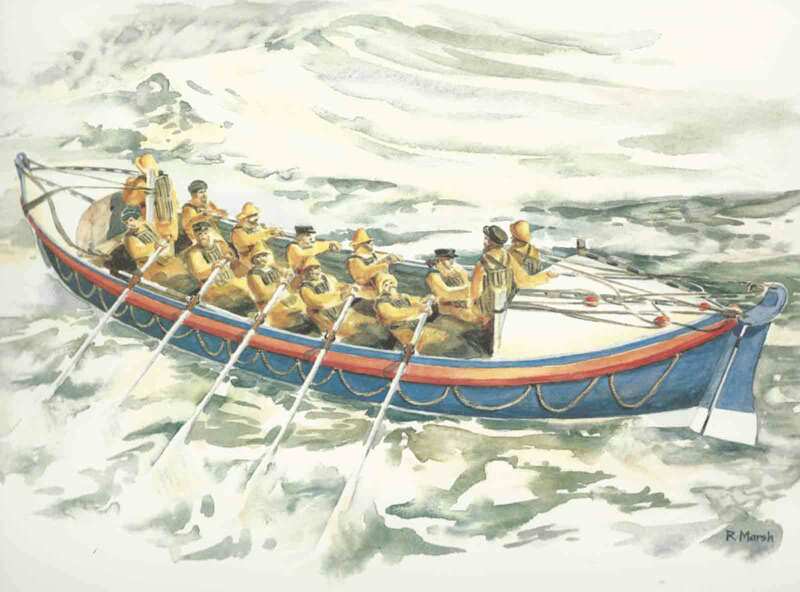 13 brave lifeboatmen: Alfred Dean (cox), Charles Lee (2nd cox), James & Luke Wells, W Davis, George Goble, S Street, G Bacon, Fred Collier, H Brown, F Worley, Steve Wingfield & George Bashford. .
Lifeboat Jane renamed Henry Harris after huge donation from Worthing businessman and philanthropist. Lifeboat Henry Harris saves four lives in loss of cargo vessel. Bound for London carrying granite, schooner Theresa disabled in severe storm and driving towards coast. Distress signal acknowledged by rockets. No time to wait for horses. Lifeboat crew and helpers haul the 5 tons of iron carriage and wooden Henry Harris 400 yards across sand to the water. In the rush, one helper knocked down and run over. Lifeboat launched with great difficulty in horrendous swell of heaving sea. Returns with 4 drenched mariners. Carriage broken in rush to launch. Lifeboatmen and helpers drag weighty craft over vast sand and up beach. Repairs carried out immediately, ready for emergencies. Replaced boat on carriage in lifeboat house by 12.30 following morning, after strenuous 7 hrs duty. On service: Charles Lee (cox), Luke Wells (acting 2nd cox), James and George Wells, George Goble, John Dunford, Fred & Bill Collier, Bill & Arthur Marshall, George Riddles, George Parker Wingfield and Thomas Bridger junior. Wrecked at east Worthing, Theresa broken up by full fury of lashing waves. Captain&apos;s valuable gold never found. Maybe buried by tide under sea bed?. Coastguard spots brig being blown ashore towards Goring in gale. Horses and helpers draw Henry Harris and carriage westward along coast road and launch. Lifeboat crew: Charles Lee (cox), Mark Wingfield, W Wingfield, Steve Wingfield, George W Parker Wingfield, T Davis, George Riddles, E Bacon, P West, Fred Collier, George Belton & Joe Street. French barque and Guernsey brig collide - brig Never Despair goes down; wrecked barque Edmund Gabriel runs aground at east Worthing. Lifeboat Henry Harris launched for survivors, then assists tug in unsuccessful attempt to tow the barque off. Lifeboat crew on service: Charles Lee (cox), Steve, George & Tom Wingfield, Fred & Bill Collier, William Groves, George Grevatt, George Irvine, Frank Burden, F Bacon and F Wakeford. New 34 feet long lifeboat built, of latest type and named Henry Harris at Queen Victoria Jubilee celebrations. Stalwart Worthing lifeboat crew invited to take part in Lord Mayor&apos;s Show in London. Lifeboat saves 10 in grounding of coal-carrying Sunderland brig Albert H Locke.and instructed to secure it from colliding with Pier. Two rescues in one day, east and west, save 14. From 230 ton Norwegian schooner Kong Karl foundering off Lancing, and 505 ton German barque Capella in difficulties off West Worthing. Fishermen launch ferry boat to help. Coxswain Charlie Lee awarded Silver Medal. His lifeboat crew: Fred Marshall, George, Tom & Stephen Wingfield, George Belton, Harry Marshall (bowman), Jack Elliott, Fred Wakeford, Peter West, Frank Burden, Bill Collier, and Luke Wells. Ferry boat crew: Henry (Harry) and William (Bill) Blann, John Riddles, Joe Street, Mark and Arthur Marshall, James Tester, Charles Lambeth, William Poland, Charlie Stubbs, Frank Collier, James Medhurst, Tom Giles and Richard Cusden. 130 strong unsung hero helpers assist launches and retrievals. Aged 47, lifeboatman George Riddles dies of heart attack on quarterly exercise. Another dies suddenly at 53. First Lifeboat Day. Unique spectacular 4 lifeboats racing event. Lifeboat Henry Harris saves solitary French captain from foundering 160 ton brigantine Halcyon after crew had abandoned ship earlier. Lifeboat crew: coxswain Charlie Lee, 2nd cox Harry Marshall, Fred, Mark & Arthur Marshall, Bill Blann, Steve & Tom Wingfield, Frank Collier, G Benn, G Belton, F Wakeford and SBacon. Lifeboatman Charles Lambeth run over and killed by boat carriage while rushing to rescue. Lifeboat saves 2 yachts Britannia and Skylark endangered in dramatic storm. 10 Norwegian crew of 3-masted barque Ophir rescued by lifeboat and breeches buoy at Lancing. Lifeboatmen on service 6½ hrs:Charlie Lee (cox), Harry (2nd cox), Arthur, Fred and Mark Marshall (4 brothers), Steve (bowman) and George Wingfield, Fred Collier, George Belton, Fred Wakeford, Bill Blann, George Benn and Jack Elliott. A signalman, 6 horses and 46 men to launch and haul-up were also used. Crew of 5 saved from schooner Flora Emily, of 99 tons burden with cargo of potatoes, stranded off West Worthing. Lifeboat Henry Harris was returned to the lifeboat house in record time of just 1½ hrs on service. Crew: Charlie Lee (cox), Harry (2nd cox), Mark, Fred & Arthur Marshall, George Wingfield, George Benn, Bill & Frank Collier, Jack Elliott, J Bridger, Frank Burden and Bill Blann. Wind-powered Henry Harris launched with 13 crew to large distressed steamship Paroo carrying 1600 passengers to Australia, drivenby force 6 towards Worthing. Against strong headwind takes 2½ hrs to reach, then sun sets. Steamer repaired, veers away from coast. The stalwart lifeboat crew on duty since 8.30 am: Charlie Lee (cox), Harry Marshall (2nd cox), Fred Marshall, Steve Wingfield (bowman), Tom Wingfield, Frank & Bill Collier, Frank Burden, J Bridger, Bill Blann, Jack Elliott, Wm Cousins and George Belton. After 26 yrs cox Lee retires, awarded Bar to Silver Medal and small pension. .
Lifeboat Henry Harris rescues crew of drifting 91 ton schooner Prince Llewellyn loaded with slates on collision course for Pier. Lifeboatmen on scene for 8 hrs: Harry Marshall (cox), his brothers Fred and Mark, Bill Blann (2nd cox), his brother Harry, Steve Wingfield (bowman), his relatives George and Tom, Fred Wakeford, George Benn, George Belton, Steve Bacon and William Curvin. Henry Harris launched after multiple attempts in hazardous gale-whipped sea to large 2,225 ton distressed steamship Indiana loaded with oranges. Violent gale prevents use of sail, and 13 lifeboatmen row 3 miles (1½ hrs) against strong SSW gale to reach sinking British steamer. No sign of crew, lifeboat returns to station. Immediately relaunched as damaged lifeboat from SS Indiana spotted. Lifeboatmen and helpers worked through from 1st launch at 7.30 am till 1 am next morning when Henry Harris rehoused, 17½ hrs for men of incredible stamina. Lifeboat crew: Harry Marshall (cox), his brother Mark, Bill Blann (2nd cox), his brother Harry, Steve Wingfield (bowman), his relation George, George Newman, Wm Wells, Joe Street, George Benn, George Belton, Frank Collier and Wm Cousins..
New improved pulling & sailing lifeboat, Richard Coleman ON 466, 35 x 8½ ft. Initiated by ceremonious parade and demonstrations by multiple lifeboats, watched by thousands. Crew in new boat: Harry Marshall (Cox), Steve & Tom Wingfield, Joe Street, George Benn, George Belton, Harry Blann, Wm Curvin, Arthur Marshall, Jack Elliott, Fred Collins and Steve Bacon. Crew in old boat: Bill Blann (cox), Frank Collier, Fred & Mark Marshall, George Wingfield, Wm Cousins, Frank Burden, George Newman, James Groves, Wm Wells and &apos;Jacko&apos; Burgess. New method of launching lifeboat: Hawser from lifeboat bow, passing through pulley block attached to Pier landing stage, heaved by line of volunteers on Pier. (Pulley block in custody of author). Richard Coleman launched to 500 ton barque Lizette aground ½ mile off lifeboat house. Harry Marshall (cox), Bill Blann (2nd cox), Steve & Tom Wingfield, Joe Street, Frank & Wm Collier, Jack Elliott, George Benn, James Groves & Wm Wells. After 3 mnths severe headaches, lifeboatman Steve Bacon commits suicide. Buried with full honours. Worthing chosen by RNLI HQ to be filmed in action by Gaumont&apos;s for nationwide publicity. Strong headwinds break steering gear and mainmast of Swedish barque Liburna with crew of 10. Lifeboat Richard Coleman launched in appalling conditions when the gale-driven 467 ton ship carrying timber from Gothenburg to East Africa is a mile off Worthing. Giant wave strikes, completely fills Richard Coleman with water. Automatic valve system readily drains the craft. Crew all safe: Harry Marshall (cox), Bill Blann (2nd cox), Steve & George Wingfield, Fred, Frank & Bill Collier, Frank Burden, George Benn, Wm Cousins, Wm Curvin & George Belton. Out of 285 lifeboat stations nationwide, Worthing crew again chosen to represent RNLI in a lifeboat at procession of Lord Mayor&apos;s Show in London. Harry Marshall (cox), Bill Blann (2nd cox), Steve Wingfield (bowman), Fred Marshall, George Newman, George & Charlie Wingfield, Frank & W Collier, &apos;Jacko&apos; Burgess, George Benn, F Burton & W Cousins. They returned home that evening. Rower rescued in Channel. At 11.15 next day, cold November morning, lifeboat cannon fired to summon crews for rescue. 7 back from London made it. 6 from reserve crew substituted to make full crew of 13. Small 14 ft craft found 6 miles out still drifting at 3 knots, occupant found collapsed from exhaustion. Resuscitated by brandy and rubbing of numb limbs aboard lifeboat. Returned to shore towing the pleasure craft. 13 crew: Harry Marshall (cox), Bill Blann (2nd cox), Steve Wingfield (bowman), cox&apos; brothers Fred & Mark, 2nd cox&apos; brother Harry, Frank Collier, Wm Curvin, George Newman, George Belton, George Benn, Tom Wingfield & Joe Street. Former lifeboatman Mark William Benn dies from bout of flu and asthma developed from lifeboat service. Mysterious distress flares and flashlights spotted SE. Arduous launch of Richard Coleman in dark at low tide. In driving rain, 8 horses and 48 volunteers grapple and haul carriage with lifeboat across ¼ mile of slippery rocks and sand at low tide. 3½ hr search of area to Shoreham and 6 miles out finds nothing. 13 crew Harry Marshall (cox), Bill Blann (2nd cox), Steve Wingfield (bowman), Steve Wingfield junior, George & Tom Wingfield, Fred & Mark Marshall, Harry Blann, Frank & Fred Collier, George Benn & George Finnis. Lifeboatmen abandon former cox Charlie Lee&apos;s funeral for urgent duty. In teeth of NE gale-driven cold rain, 50 volunteers launch Richard Coleman. Shoreham rowing boat Mauretania in difficulties taken in tow and 4 occupants, themselves Shoreham lifeboatmen, landed at Worthing. 13 crew: Harry Marshall (cox), Bill Blann (2nd cox), Fred Collier (bowman), Fred Marshall, Wm Cousins, George Benn, George & Tom &apos;Jumbo&apos; Wingfield, Steve Wingfield junior, Frank Burden, George Finnis, Jas Groves & &apos;Jacko&apos; Burgess. White distress rockets spotted, but vital 10 hour all-night lifeboat search 15 miles out finds nothing. 66 volunteers launch & haul-up. 12 crew: Harry Marshall (cox), Steve Wingfield (2nd cox), George Wingfield (bowman), Tom &apos;Jumbo&apos; Wingfield, Fred & Mark Marshall, George Benn, Fred Collier, &apos;Jacko&apos; Burgess, F Hutchinson, George Finnis & Wm Cousins. Drifting barque with storm-shredded sails spotted off Worthing. Dramatically dangerous rescue by 3 lifeboats and tug saves 14 Italian crew of this 1,060 ton iron-hulled Andrac carrying cement. Worthing&apos;s 71 volunteers struggle to launch lifeboat in powerful 70 mph gale. Richard Coleman returns with exhausted Italians and 13 drenched, weary lifeboat crew: Harry Marshall (cox), Bill Blann (2nd cox), Steve Wingfield (bowman), Bill Blann junior, Harry Blann, Joe Street, James Groves, &apos;Jacko&apos; Burgess, Steve Wingfield junior, George Wingfield, George Benn, Fred & Mark Marshall. Distressed sailing barge spotted 2 miles east. Richard Coleman launched in mighty gale, but 4 hr search found no sign of it. 63 volunteers to launch and retrieve lifeboat. Harry Marshall (cox), Bill Blann (2nd cox). Lifeboat capsizes twice - crewman drowns. Westward bound schooner, Kings Hill with 180 tons of bagged manure, sails in shreds, gale-driven shorewards. Helped by off-duty soldiers, volunteers launch Richard Coleman. Treacherous conditions limit headway to 1½ knots. Gigantic wave swallows her. Crew thrown into sea except 2nd cox Bill Blann who holds on to mizzenmast. Boat self-rights and crew scramble aboard. Another huge sea breaks over her. Capsizes again and crew flung out once more. Boat uprights again with Bill Blann still hanging on to mizzen mast. Throws lifelines and saves cox Harry Marshall and others. But &apos;Jacko&apos; Burgess, 150 ft away, could not be reached. Thousands turn out for funeral cortege. Harry Marshall retires, Bill Blann promoted to coxswain. Richard Coleman launched with 12 crew under coxswain Blann to marooned 1,500 ton Italian sailing barque Pierre Antonine. Bill&apos;s brother bowman Harry Blann throws lifeline to stricken crew. 43 volunteers launch & haul-up lifeboat. Richard Coleman launched by 42 volunteers in force 9 with 12 crew under cox Bill Blann to rescue motor boat Shamrock II and 2 occupants. Last active service for retiring lifeboatman Fred Marshall. 3 top men in British Motor Boat Club&apos;s annual race rescued in storm from 15 ton motor launch Lavengra by lifeboat Richard Coleman. Richard Coleman launched on 2 occasions in answer to distress rockets. Enduring 8hr service by 12 lifeboatmen under cox Bill Blann when Richard Coleman rescues broken-down motor yacht and 3 occupants. Richard Coleman launched at night in fog on receiving SOS from steamer 22 miles away, returns the next night, 14 hrs later. 5 drown in 3 boat accidents - public appeal started for Rescue Boat. Town hall and Plaza cinema open. Kenneth & Gerald launch. Pier fire. Odeon cinema opens. Boat Club gains Sexton Cup and new premises. New southern pavilion opened. Hargood Room opened at museum. Rescue Boat Kenneth & Gerald sold off. War declared. All boats taken off beach and put on wasteland. Final year for Lifeboat showpiece museum. RNLI sells Lifeboat house and Richard Coleman goes to Maritime Museum. RNLI inflatable inshore rescue boat (IRB) stationed at Worthing. IRB removed despite saving seven lives on 32 services. Tall flagmast, a popular landmark on prom, removed by Worthing Borough Council. Worthing Borough Council refuse to take Richard Coleman back. Arsonist destroys Richard Coleman whilst stored on Southend beach. Campaign to reinstate lifeboat house as a unique showpiece museum. Lifeboat house converted into a residence. A Town&apos;s Pride: Victorian Lifeboatmen & their Community published. Edwardian Worthing: Eventful Era in a Lifeboat Town published. New Street pub themed on Worthing’s lifeboats. Renamed &apos;A Town&apos;s Pride&apos; with name and picture of Worthing lifeboat copied directly from front cover of the book. Interior adorned with countless framed and captioned photos from the books &apos;A Town&apos;s Pride&apos; and &apos;Edwardian Worthing&apos;. Vintage Worthing: Images of a Lifeboat Town published. George, H, James, S Bashford. 3 x great grandson of rescuer John Belville drowned 1850. 2 x great grandson of Tom Blann, 2nd Coxswain. Great grandson of Harry Blann, Bowman. Great grand nephew of Bill Blann, last Coxswain. Copyright © 1980 - 2019 Rob Blann. All rights reserved. No part of this publication may be reproduced, stored in a retrieval system or transmitted in any form or by any means, electronic, mechanical, photocopying, recording or otherwise, without the prior permission of Rob Blann.